Dusan Tadic scored twice as Southampton eased past relegated Aston Villa to keep alive their faint hopes of European football. Shane Long netted an early header then raced onto Leandro Bacuna's awful backpass and squared for Tadic to double the lead. Ashley Westwood pulled one back for Villa, before Long again set up Tadic to finish from the edge of the area. Westwood swept in his second before Sadio Mane headed in in injury time. Southampton remain eighth, but close the gap on sixth-placed West Ham to two points, although they have played a game more. This was far from Villa's worst display of the season, but they still faced a mutinous atmosphere as they slipped to a tenth straight defeat, with fans booing incessantly, littering the pitch with paper planes and staging an organised protest in the 74th minute. Caretaker boss Eric Black replaced Ciaran Clark with Micah Richards in the centre of defence but it made not a scrap of difference as Villa conceded four goals for the fifth time this season. Richards and centre-back partner Joleon Lescott were horribly exposed by the pace, verve and movement of Southampton's forward line. Long in particular was made to look like a world-beater, finding acres of space to convert Ryan Bertrand's superb left-wing cross, then scorching past Lescott after Bacuna's error before rolling the ball across to Tadic. Richards, a former England international and the club captain, suffered the indignity of being hauled off at half-time in favour of 19-year-old academy player Kevin Toner. But that makeshift arrangement failed to patch the huge holes in Villa's rearguard and they were once again torn apart as Long chased onto a simple channel ball and set up Tadic to claim his sixth assist of the season. By the time substitute Mane was left unmarked to glance past Brad Guzan, the scale of the repair job facing whoever leads Villa in the Championship next season had been made abundantly clear. In truth, however, this was not a display without redeeming features for Villa. While their defence was shambolic, they attacked with constant endeavour and occasional moments of quality, recording 16 shots - only one fewer than their opponents. Westwood recorded his first goals in 57 league appearances, first connecting with a cross from the indefatigable Jordan Ayew shortly before half-time, then sweeping in a first-time effort when Jack Grealish's centre reached him on the edge of the area. Lescott described relegation last week as "maybe a weight off the shoulders", and Villa did in patches play as if a burden had been lifted, despite the hostile atmosphere. To more charitable eyes, this performance might even have seemed to offer some hope for next season's Championship campaign, but the fury of the supporters was entirely understandable after a dreadful run of results. For all their enterprise going forward, this was still a sixth straight home league defeat for Villa - the worst sequence in the club's history. Aston Villa caretaker manager Eric Black: "We created more chances. We had two or three chances, and if we'd taken them, we might have got something. But if we have to score five goals at home to win a game, then we're going to be in for a tough challenge. We did get a response under difficult circumstances, but it wasn't enough to win the game. "We conceded poor goals that put us on the back foot. There was a response, and credit for that, but on the day it wasn't enough. "The fans are entitled to vent their displeasure. It's not an ideal atmosphere, but it's understandable, given the circumstances. We have to continue to be professional." Southampton manager Ronald Koeman: "Scoring four goals away from home is good but we conceded two and that is not like Southampton. We gave Villa the belief that they could get a better result. In the end, we were by far the better team. It was a good result finally, and we're on to the next game. "Scoring goals was not a problem today, but in general we have been missing too many opportunities away from home. That is why we are a little way behind the fifth and sixth positions in the table. "It was difficult because it was a strange atmosphere - but even more so for the home team. It's a shame that Aston Villa have been relegated because it is a great club and stadium. I hope they are back before too long." Shane Long has netted more goals (six) against Aston Villa than against any other Premier League opponent. This is now Long's best goalscoring season in the Premier League, with nine goals. Southampton have scored 14 headed goals in the Premier League this season, more than any other side. Aston Villa have conceded goals in 30 of their last 34 Premier League matches. Southampton host Manchester City next Sunday and Aston Villa visit Watford on Saturday. Match ends, Aston Villa 2, Southampton 4. Second Half ends, Aston Villa 2, Southampton 4. Attempt missed. Ashley Westwood (Aston Villa) right footed shot from outside the box misses to the left following a corner. Attempt blocked. Alan Hutton (Aston Villa) header from the centre of the box is blocked. Assisted by Jack Grealish with a cross. Corner, Aston Villa. Conceded by Dusan Tadic. Attempt saved. Scott Sinclair (Aston Villa) left footed shot from the centre of the box is saved in the centre of the goal. Assisted by Rudy Gestede. Goal! Aston Villa 2, Southampton 4. Sadio Mané (Southampton) header from the centre of the box to the bottom left corner. Assisted by Cédric Soares with a cross. Foul by Kevin Toner (Aston Villa). Foul by Steven Davis (Southampton). Ashley Westwood (Aston Villa) wins a free kick in the defensive half. Corner, Southampton. Conceded by Aly Cissokho. Attempt missed. Shane Long (Southampton) right footed shot from the right side of the box is close, but misses to the right. Assisted by Dusan Tadic. Hand ball by Idrissa Gueye (Aston Villa). Goal! Aston Villa 2, Southampton 3. Ashley Westwood (Aston Villa) right footed shot from the centre of the box to the bottom right corner. Assisted by Kevin Toner following a corner. Corner, Aston Villa. Conceded by Fraser Forster. Offside, Southampton. Ryan Bertrand tries a through ball, but Shane Long is caught offside. Idrissa Gueye (Aston Villa) is shown the yellow card for a bad foul. Jordy Clasie (Southampton) wins a free kick on the right wing. Foul by Idrissa Gueye (Aston Villa). Attempt missed. Shane Long (Southampton) right footed shot from the centre of the box is too high. Corner, Southampton. Conceded by Scott Sinclair. Delay in match Alan Hutton (Aston Villa) because of an injury. Foul by Sadio Mané (Southampton). Corner, Aston Villa. Conceded by Cédric Soares. Goal! Aston Villa 1, Southampton 3. Dusan Tadic (Southampton) left footed shot from outside the box to the bottom right corner. Assisted by Shane Long. Substitution, Southampton. Sadio Mané replaces Jay Rodriguez. Substitution, Aston Villa. Jack Grealish replaces Carlos Sánchez. Attempt missed. Rudy Gestede (Aston Villa) header from the centre of the box is too high. Assisted by Aly Cissokho with a cross. Attempt saved. Jay Rodriguez (Southampton) right footed shot from outside the box is saved in the top centre of the goal. Assisted by Jordy Clasie. Attempt saved. Idrissa Gueye (Aston Villa) right footed shot from outside the box is saved in the centre of the goal. Assisted by Scott Sinclair. Corner, Southampton. 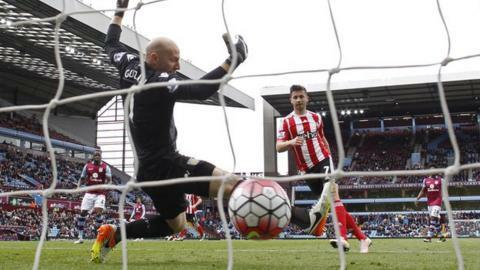 Conceded by Brad Guzan. Attempt saved. Steven Davis (Southampton) right footed shot from a difficult angle and long range on the left is saved in the top left corner. Substitution, Aston Villa. Rudy Gestede replaces Jordan Ayew. Alan Hutton (Aston Villa) is shown the yellow card for a bad foul.